Although there is gridlock in the nation’s Capitol, Bennet has recently toured the state with his Republican counterpart Sen. Cory Gardner. Common ground most often has been found on water issues. In his opening remarks, he noted that his first legislation was a bill to provide a funding mechanism for the Arkansas Valley Conduit, and among his most recent was creation of the Browns Canyon National Monument. Bennet hit the key points that are driving Colorado to develop a water plan by December: agriculture, recreation, the environment and continued urban growth. “Water sustains our agriculture industry. It sustains the rivers, wildflowers and wildlife that bring in $13.2 billion in outdoor recreation spending every year. Water fuels the existence and growth of businesses throughout the state that have helped us build one of the strongest economies in the country,” Bennet said. His message on this year’s ample rainfall was mixed. Lake Powell is just 53 percent full, and inflows will be about 88 percent of normal this year. Lake Mead is only 38 percent full. 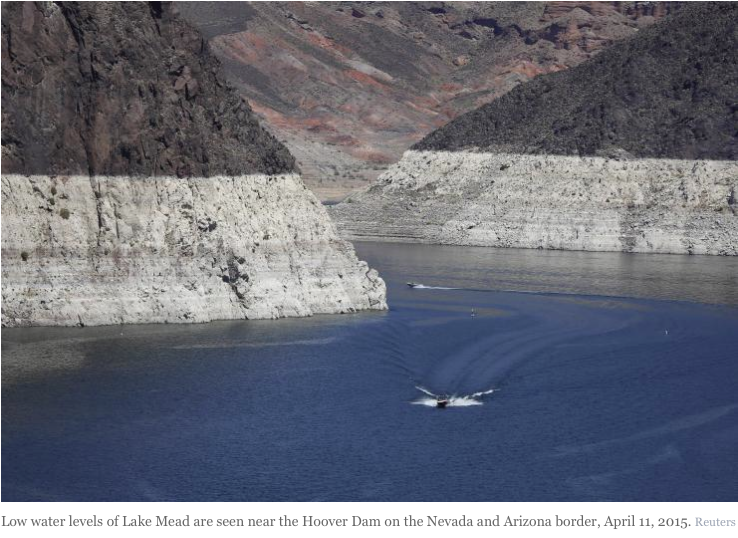 “It’s incredible to think that the water level in Lake Mead has dropped by about the height of a 15-story building since 1983 over the surface of the lake. That’s about 18 million acre feet of water, potentially enough for 70 million families for a year,” Bennet said. Bennet supports working with other states in the Upper Colorado River basin (New Mexico, Utah and Wyoming) as the lower basin states (Arizona, California and Nevada) continue to rely more heavily on the Colorado River. Fountain Creek isn’t the only area of the state where storm control and water rights have collided, the Colorado Water Congress learned Wednesday. As in the Marx Brothers classic movie. Law-makers have overstepped their responsibility and subjected water law to “death by a thousand small cuts” by passing SB212 and HB1016, said Alan Curtis, a water lawyer with White and Jankowski. Curtis lampooned the bills, along with failed legislation to allow rain barrels (SB1259) by showing video clips from “Monkey Business” — including Harpo’s antics in the crowded cruise ship cabin, jumping out of line in port and roiling the lemonade by splashing his legs in it. He ended by asking “which Marx Brother are you?” He declared he is Groucho and those who passed the legislation are more like Karl. Curtis’ point was that the new laws that passed, like the rain barrel bill that did not, jump some water rights ahead of others that have been in line for 150 years of water law, amounting to a taking of property rights. They also put the responsibility to prove damage on the party who is injured, which is the opposite of most water law, which requires proof of no injury or mitigation. Engineer Jim Wulliman and Alan Searcy, of the Colorado Stormwater Council, argued that stormwater retention ponds are useful both to enhance water quality, by settling water, and to restore channel flows to pre-development conditions. Wulliman detailed how paving urban surfaces sets up a scenario for damage to waterways as more water drains more quickly, causing erosion. Finally, Steve Vandiver, general manager of the Rio Grande Water Conservation District, said the state Legislature moved too fast to pass the stormwater bill, saying junior water rights holders could be injured. Fountain Creek has been struggling with the stormwater control/water rights issue for years. It was removed from SB212, with the exception of Colorado Springs, which has a stormwater discharge permit. This year, a preliminary study by the Fountain Creek Watershed Flood Control and Greenway District attempted to quantify the damage at certain flows and suggested ways to mitigate the damage. Pueblo County has hired Wright Water Engineers to quantify the damage caused by development in Colorado Springs to Fountain Creek.